For the past 147 years, Crown Hill has recognized its responsibility to those who have served their country with its national cemetery and three military veterans sections. The events of September 11 and the death of Jason Baker prompted Crown Hill to develop a unique memorial that would memorialize fallen heroes among public safety personnel locally, statewide and nationally. Working with the Baker family, funds were raised to build a lasting memorial. The Heroes of Public Safety Section was dedicated on September 14, 2002. Located in the most historic area of the southern part of the cemetery, this section encompasses approximately 1.5 acres and can accommodate more than 1,500 burial spaces. Members of public safety killed in the line of duty are provided free burial space and complete cemetery and funeral services at no cost. The Heroes of Public Safety Memorial marks the entrance to this section and consists of a granite slab walk that leads to a Romanesque monument. 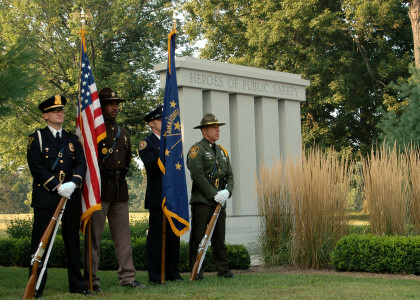 Indiana public safety professionals killed in the line of duty are memorialized on the walk surrounding the memorial, while other public safety professionals are recognized with inscriptions on the walk leading to the memorial. This section is the final resting place for many of our state’s heroes, including Marion County Sheriff’s Deputies Jason M. Baker, Jeff Jones and Kim Hefner, Indianapolis Firefighter Paul Jolliff, Indianapolis Police Officer Timothy “Jake” Laird, Butler University Police Officer James Davis and Trooper Greg Belt and Lt. Gary Dudley of the Indiana State Police.